Home • More Magic • What is Midsummer? Midsummer is a main national holiday in Finland. It is a celebration of the start of summer and the midnight sun. Finnish Summers are beautiful and the sun shines bright all day and all night, marking a stark contrast with the snowy, dark winters! Originally, Midsummer was celebrated with an ancient feast and fertility love spells, however, now it is a chance for people to escape the chaos of the city and flee to beautiful countryside to celebrate and relax, with bonfires, dancing, music, food and sauna-bathing! Midsummer is celebrated on June 24th and the midsummer festivities tend to take place on Midsummer Eve. Midsummer is also the time of summer solstice, which marks the longest day of the year and a turning point after which the days begin to shorten again in the Northern hemisphere. The day of summer solstice in 2017 was June 21st! During the period called polar days, the nights are short and light. In regions north of the arctic circle the sun does not set below the horizon at all for several weeks (hence why Lapland is often referred to as the land of the midnight sun). In the village of Nuorgam, situated near the northernmost point of Finland, the sun does not set between the mid-May and the end of July. 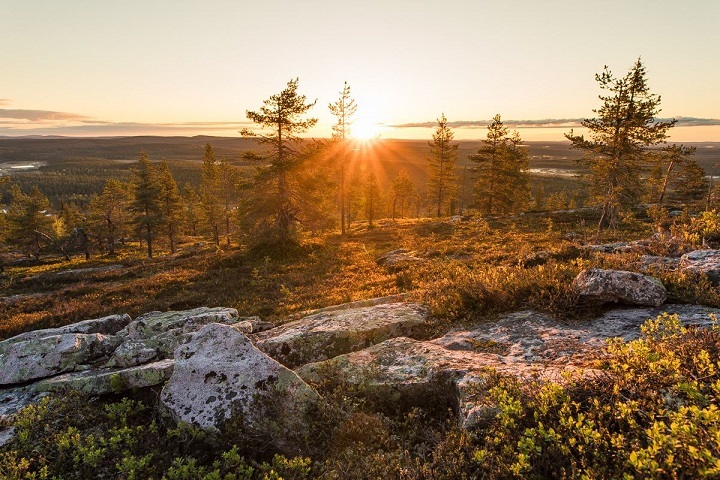 Read our blog about Lapland - the home of the midnight sun here.